Anyone can be caught in the grip of an emergency at any time. That’s why when lives are on the line and every second counts, Medair responds quickly to reach communities in need and provide them with life-saving services. When conflict or disaster forces families from their homes, we focus on survival and safety. We supply appropriate tents to vulnerable families for immediate protection, and emergency household supplies and hygiene kits to help keep families healthy. 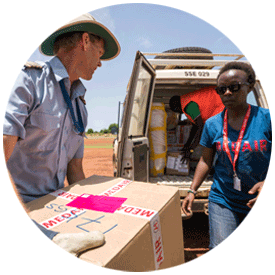 Health care is often among the first vital services crippled or destroyed during crises. With your support, Medair fills the gap. 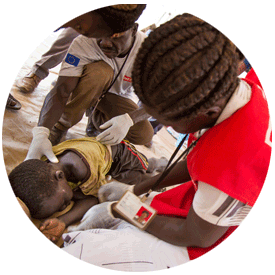 Our teams of health professionals set up emergency health clinics in crucial places like camps for refugees and displaced people, where the influx of people overwhelms local health services. Medair can quickly scale-up our response to carry out mass vaccination campaigns for diseases such as measles and cholera to prevent or stop the spread of outbreaks. When a crisis strikes and health risks multiply, few things are more important for saving lives than clean water and sanitation. Medair provides safe drinking water and latrines, and promotes safe hygiene practices, all of which contribute to healthier places for families to live while they recover. Medair provides families in crisis with cash assistance to improve their temporary living conditions. Cash assistance allows families a dignified way to pay for their rent, food and medical costs, by enabling them to make decisions about purchases to meet their most urgent needs.